Repairs often result from either an unexpected or unplanned incident, but they don’t have to. An unexpected repair is usually one caused by neglect, lack of regular maintenance or lack of regular vehicle inspections. Most repairs don’t have to be a surprise. It's our job to inspect, inform and consult you. Our complimentary Multi-Point Vehicle Inspection, which is included with our basic lube, oil, and filter service, is a report which lists repair recommendations and estimates, allowing you to make an informed decision. 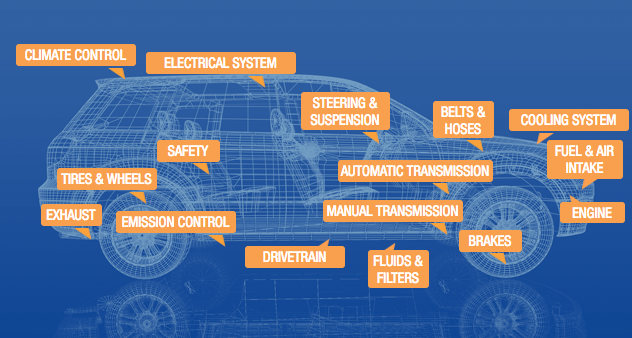 Our inspection focuses on the safety and performance components of your vehicle and is designed to provide you with a status report describing the mechanical condition of your vehicle with recommendations and estimates for any deficiencies discovered. The result will allow you to be in a position to make a well-informed decision based on your specific needs. This is our value added approach to building long-term relationships with our clients.